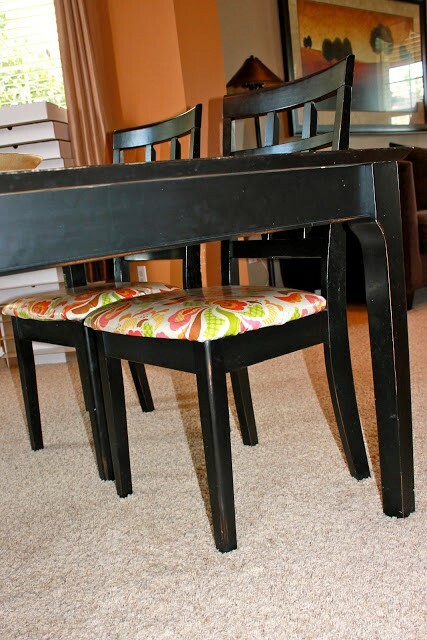 So, a few weeks ago I showed how I upholstered my new kitchen bench (see that post here). This weekend I decided I was going to do the same with my dining room chairs. I can’t even believe I’m showing this considering their condition. But honestly, with two little kids, I was putting it off as long as I could. I couldn’t wait any longer. I had left over fabric from the bench project as I mentioned above. I bought this from Fabric.com. The best part about this fabric is that it is laminated–meaning, I can wipe it down. Yippee!! First, I simply turned a chair over on its side and removed the 4 screws attached to the seat base. Then I popped off the seat. Wow pictures really don’t lie do they? That is one scary cushion. and cut enough excess to be able to pull tight and staple on all sides. Then I used that piece of fabric as a pattern to cut the remaining chairs. When upholstering, I stapled the two longer, straight(er) sides first. Then I worked around the other sides almost as if wrapping a present. This fabric is a bit stretchy so I had to make sure I was pulling it taut the entire time. When I was finished I used a hammer to make sure all of my staples were snug. I screwed the seat base back the same way it came off and wa-la! So much better. And kid proof! Now that it is done I really am not sure why I waited to long. The whole project took me about an hour and a half. And if/when I ever get tired of the fabric it is a very easy fix. Love those kinds of projects. Today’s Daily Tip: I like to carry my paint colors and fabrics into various rooms of my house. This tends to help the house have a more cohesive feel and flow.